A mere 15 minutes from Ashland and 25 minutes from Grants Pass, lies the beautiful, warm, and welcoming city of Medford, Oregon. If you’re looking for a brand new home in Medford, Hayden Homes offers a variety of single and two-story homes to fit your needs at any stage in life. Explore your options for building a new home and contact us for details. New homes for sale in beautiful Medford, OR. 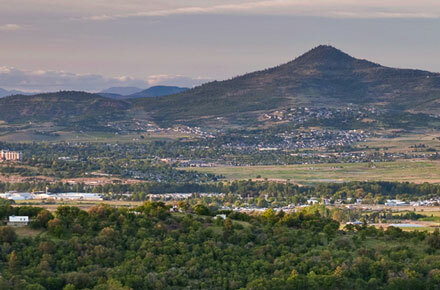 Medford is located in beautiful Southern Oregon, nestled in a rain shadow between the Cascade Range and Siskiyou Mountains, in an area known as the Rogue Valley. Medford and its surrounding area is bustling with restaurants, shopping opportunities and entertainment venues and events. Outdoor recreation is plentiful in the surrounding forests and mountains, and on the nearby rivers and lakes. Here are a few more Medford amenities you won’t want to miss: 15 minutes from Ashland – home to the famous Shakespeare Festival, and Southern Oregon University, minutes from historic Jacksonville and its popular, well-known Britt Festival, downtown Medford Craterian Theater, Pear Blossom Parade, Crater Lake and many national forests and parks. For more about Medford, the local real estate market and a few of our favorite things about the city check out the New Construction Homes in Medford Blog. Hayden Homes is your local homebuilder, ready to help you navigate the process of purchasing a new home in the Medford, OR area. Explore the homes and floor plans to find the new home that’s right for you. Experience the quiet beauty in East Medford's new home community, Delta Estates. This neighborhood is in the heart of the Rogue Valley, minutes away from Abraham Lincoln Elementary School, nearby Prescott Park, several wineries and has stunning views.